The Pokémon world seems exciting and fun, but let's not forget that its fauna is rather dangerous: this is probably why humans try to tame Pokémon and keep them around - because, without them, how would they survive? You probably would never know what hit you. Mount Silver, as it appears in the anime series. It is no wonder that you want these creatures as allies, not as enemies. 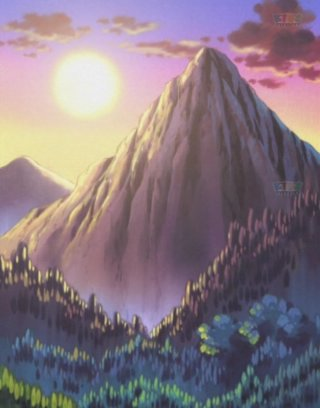 And it also is no wonder that Mount Silver in Johto, home to a particularly fearsome population of Sneasel, is forbidden to all but the most skilled of Pokémon Trainers. You really don't want to cross paths with a demon weasel alone, or even with Pokémon who are not up to the challenge. Nobody wants to clean up after that. Like weasels, Sneasel are predators; very fierce predators, no less - the description in Pokémon Pearl mentions that a Sneasel will attack its perceived enemy in a relentless fashion, not stopping until it is rendered completely incapable of moving. Unlike weasels, however, their main weapon is not their bite, but rather their large, hooked claws - which links back to the kamaitachi and its sickle-like claws. The claws are described as extensible; however, we've never seen a Sneasel extend or retract its claws, neither in the games nor in the anime - they are depicted as always being the same length. What an oversight! A slashing Sneasel, as depicted in the anime series. Considered that we've seen several Sneasel battle in the anime, this would mean that the way that Sneasel are usually portrayed is with the claws out. Perhaps it's just that we've never seen a Sneasel being so at ease that it would feel comfortable retracting them. 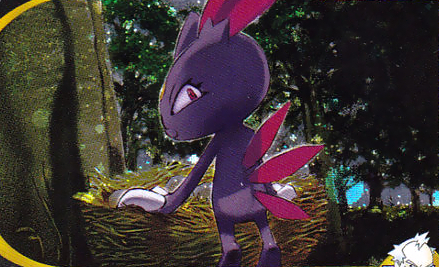 In nature, Sneasel do not use their claws solely as a weapon; as they live in forested areas, their claws are also useful to climb trees and access the nests of bird Pokémon such as Pidgey to prey on the eggs. They prefer to attack unguarded nests, but, if that is not an option, Sneasel have developed a strategy to drive the parents away from the nest: they can work in pairs, with one acting as a bait to lure the bird Pokémon away as the other takes the eggs. Another use for their claws is more defensive: when a Sneasel is attacked, its first reaction will be to suddenly extend the claws, hoping to startle its enemy - much like certain moths do by flashing the eye-shaped markings on their hind wings. This causes the attacker to either flee in fear or be stunned for long enough that the Sneasel may have a chance to strike back. As shown by their ability to cooperate with each other, Sneasel are social creatures - this is especially evident after they evolve into Weavile, since they hunt in packs and have even developed a written language: they carve symbols on trees, boulders and other surfaces to send signals to each other. We are not sure if Sneasel are also capable to do that, but surely that behavior couldn't have sprouted out of nowhere after evolution, no? After all, their most famous technique is Beat Up. Green from Pokémon Adventures holding a Razor Claw and a Dusk Stone. Sneasel stealing eggs; illustration for the card Pryce's Sneasel. Is it day or night? The time of the day seems to be...holographic. It is unclear whether Sneasel are diurnal or nocturnal. While they seem much easier to encounter at night, the fact that their main prey seems to be the diurnal Pidgey would lead us to think that they are about in the day. Either this information is incorrect, or Sneasel does not belong to either group and is active at any time of the day and night. Or maybe they just do whatever they want. They're Dark-types! They're rebels! They're not bound by silly things like day and night! However, one thing is for sure: the natural habitat of Sneasel is cold mountain forests or icy caves, true to its connection with the kamaitachi and to its designation as an Ice-type. As such, while Sneasel is somewhat rare in more temperate areas and completely absent in warmer climates such as that of the Hoenn region, it is very common in the cold region of Sinnoh, where it populates snowy areas. It seems to be completely unaffected by the hailstorms that are typical of that region, and it thrives in an environment that would be hostile to most other Pokémon. The rivalry between Sneasel and Meowth, as shown in the anime series. Regarding its anatomy, all Sneasel have two yellow gem-like markings on their body: one on the forehead and one on the chest. I have no idea what the marking on the chest is for, but I believe that the one on the forehead may be a sort of third eye, representative of their wit and cunning. 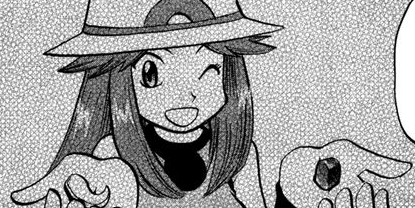 It also reminds me a bit of the coin on Meowth's forehead, so I wonder if there might be some connection there, seen how Sneasel is also somewhat cat-like in its appearance. To think of it, in the anime series there seems to be the recurring theme of a certain rivalry between Sneasel and Meowth. They are very similar, when you think about it. Even without the gems - one looks like a black cat, and the other looks like a white cat; they both have sharp claws, and are overall similar in temperament. The Sneasel-shaped Team Rocket balloon! In the episode 265 of the anime series, there was even talk within the Team Rocket trio of replacing their very own talking Meowth with a Sneasel. 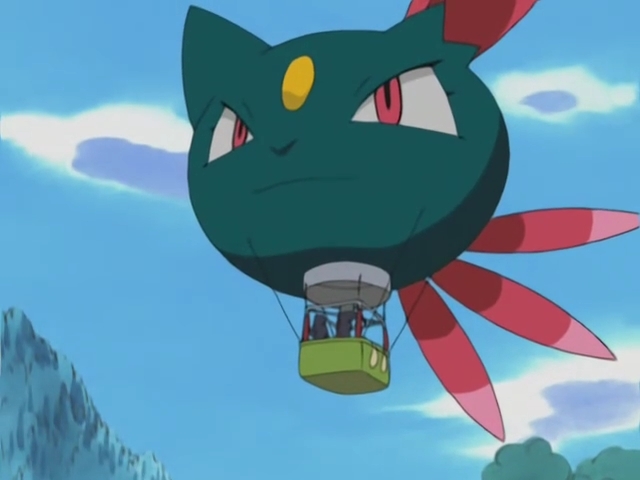 At that time, Jessie and James went ahead as to even replace their signature Meowth-shaped hot air balloon with a Sneasel one! Poor Meowth. Of course, in the end Meowth stayed, but still. Sneasel and Meowth do not seem to share habitats; Meowth prefers less cold areas, and so in nature they usually do not compete as predators. If the two were to meet, however, trouble would surely ensue - as it has indeed happened in some cases. A friendly Sneasel, as seen in the Pokémon Amie feature of Pokémon X and Y. Regarding their relationship with humans, Sneasel tend to be distrusting of people. This is shown by the fact that, when caught in the wild, their starting friendship value will be rather low - a characteristic they share with many other Dark-type Pokémon. This is not to say that a Sneasel can't become friends with a human, but rather that such a relationship might need a while to form. A Trainer who seeks to keep a Sneasel needs to earn its respect! There's also the point that a lot of the Pokédex descriptions of Sneasel tend to make, which is that it is apparently "vicious in nature". But why is it considered so bad and evil? One of the descriptions gives the rationale that it's vicious because it drives Pidgey from their nests to steal the eggs. And here I say: is that really an evil thing? Sure, this behavior might seem cruel, but isn't that what a predator has to do because of how things are? So, are Dark-types really evil? Or are they merely dark? Leaving this as food for thought, this piece ends here. Let us now move to the last informative section of this site: let's talk about a few particular Sneasel individuals that are important throughout the Pokémon series.